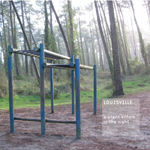 Louisville is the project of Olivier Cavaille, Felicia Atkinson, Nikolu and sometimes Sylvain Chauveau, Pierre Yves Mace and Jean Michel Pires. Olivier Cavaille works and plays with Sylvain Chauveau, Pokett, My Broken Frame and That Summer. Felicia Atkinson is a multimedia artist who works with sound, writing, drawing, and performances. She is involved in two other musical projects, one with Sylvain Chauveau and the other one, Stretchandrelax (on nowaki records) with Elise Ladoue. She has played many performances around the world such as at La Fondation Cartier, Paris, The Knitting Factory, NY and the Sala Rossa, Montreal. Nikolu is a guitar and bass hero who is also involved in ii, La Chatte, Genau and That Summer. Réunion de musiciens à la fois complets et cultivés, mais qui ont surtout le bon goût de cultiver avant tout leur instinct : comme tout voyage, A Silent Effort In The Night est ainsi, avant tout, une aventure collective, et un art de la rencontre. Les 500 premiers exemplaires de A Silent Effort In The Night sont numérotés de 1 à 500 sur 500. Digisleeve 133mmx133mm en carton recyclé 400g | Packaging par Kamarade. Listen to some tracks from the album below.